Have you recently played a 3DO Multiplayer game? Want to write a review? Post it here! I've often said that the hallmark of a Crystal Dynamics game is that it is maximally hard while perfectly fair. Perhaps because it is one of their earlier games, Total Eclipse nails the maximally hard part but somewhat misses the fair part. Like its pseudo-sequels Solar Eclipse and Off-World Interceptor, Total Eclipse is an essentially on-rails shooter which at the same time offers a great deal of freedom to roam to the left and right and a number of different paths though levels. What sets Total Eclipse apart is its hit points system. Your ship's shields are drained not only by enemy fire and collisions, but the simple passage of time. Moreover, there are only a tiny handful of shield refills. 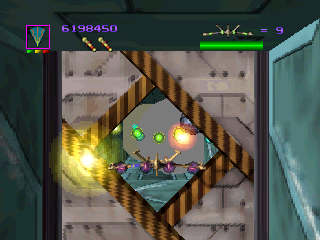 To compensate, every enemy you destroy refills a chunk of your shields. It's a cool idea, because it forces the player to engage and destroy, instead of simply avoiding enemies. And who doesn't love the idea of being a space vampire? 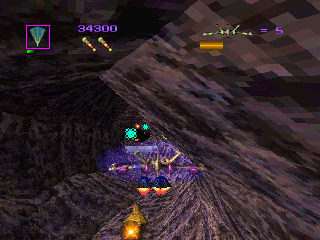 Unfortunately, in some tunnels, you need to fly at top speed just to make it from one enemy to the next before your shields run out. This is bad news because the tunnels - which comprise a full third of Total Eclipse - are gaming hell as it is. At their widest, the tunnels take up less than a full screen. Collision detection is set so sensitive that you don't need to even touch a wall to take damage, just come within a few feet of one. 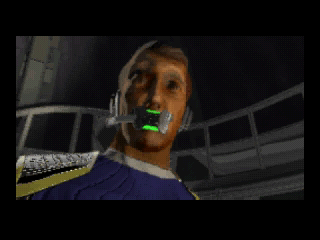 But the biggest liability in the tunnels are the game's ultra-touchy controls. Even a light tap of a directional can have your ship ramming against a wall. Tapping the D-pad to get away from the wall, unless done with the utmost delicacy, will slam you into the opposite wall. And how, you might wonder, are you supposed to avoid enemy fire in these cramped conditions? After playing through the entire game, the best answer I can offer is: Just hope they miss. Evasive maneuvers ram you into walls, which is worse than taking enemy fire because it slows and disorients you on top of the damage. The world outside the tunnels isn't much of an improvement: When you aren't winding through narrow canyons, you're usually skimming over a plateau which prevents you from flying up or down. Almost the entire game leaves you feeling hopelessly cramped, surrounded by the constant danger of crashing into the environment. Even on the occasions where you have some room to maneuver, dodging is mostly a lost cause, since enemies fire not sharp lasers but wide bursts of floating particles, like a pollen cloud. 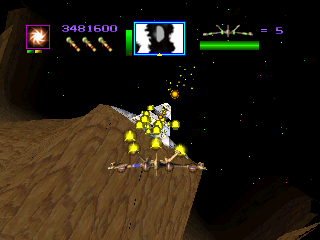 Most of the weapons available to you also take slow-moving pollen cloud form, so given how the game constantly keeps you speeding onward, sometimes your only option to fire off a few sprays at an enemy and hope something connects. All of this might be forgivable if the game gave you enough shield energy to survive the hits you inevitably take. Instead, it's not uncommon to go from full energy to dead in a single second. When you're careening down tunnels too fast to react in time to hazards, or enter a hole in a canyon wall too tiny to maneuver in and with a half dozen enemies right on the other side, all you can do is perform your best and hope you get lucky. That makes it all the more appalling that there is no save or password function. 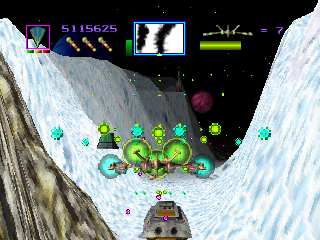 Total Eclipse is incredibly long by space shooter standards: a whopping 20 levels, some of them agonizingly long. Even a no-deaths playthrough takes an hour and a half. That's too long for a requisite play session. And when you're dealing with dozens of sections which give you no room to maneuver, causing numerous unfair deaths, having a limited number of lives and continues with which to get through the game isn't quite fair. Even if there were a password function, I'd call the game excessively long. The game design does nothing to explain why Crystal Dynamics felt the need to stretch the game so far beyond the half hour length which was then normal for games of this type. There are only a handful of enemy types, and level designs frequently recycle ideas. And some of these ideas are terrible, like canyon mazes where sometimes even the admittedly handy mini-map doesn't let you see a dead end before you make a turn leading to it. Finally, apart from the volcano boss at the end of world 2, the five bosses are all simple variations on the same idea. The cutscenes are even more monotone. Apart from the intro, which sets up the standard plot of "aliens attack, Earth fights back", the six cutscenes are all the same: your ship flies away from the previous world, and your commanding officer gives a vague nod, congratulates you, and tells you what your next objective is. The soundtrack deserves special mention for its awfulness, which is a surprise since it's by Burke Trieschmann. Constantly wailing guitars and saxophones are the foundations for compositions which are dull, inappropriate to the tone of the game, and somehow seem to fade into the background despite their noisiness. Nonetheless, it's easy to see why Total Eclipse was such a big deal in its day. 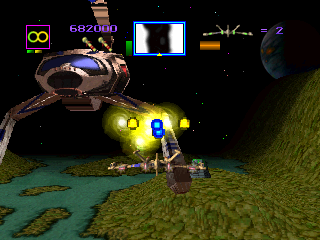 3D space shooters had precedents in Star Fox for the Super NES and Cybermorph for the Jaguar, but in terms of technical accomplishment and visual aesthetic, Total Eclipse easily trumps both of them. Rather than dodgy polygonal ships, Total Eclipse uses slick-looking scaling sprites which radiate presence. The environments are composed of surprisingly smooth and detailed texture-mapped polygons. Enemies explode into a shower of molecules with a satisfying "boom". The whole thing moves at blisteringly fast speeds while maintaining a steady frame rate. Mind you, that frame rate is in the realm of 15-20 fps and does sometimes dip when you hit the speed boosters in the tunnels, making an unfairly hard game even harder, but in terms of simple wow factor it's terrific. No other home system of the time could pull this off. I try to stay as objective as possible in my reviews, and sometimes that means giving a low score to a game that I enjoyed (see my review of Star Wars: Rebel Assault for example). The reverse is rare, because usually if I dislike a game and have even a slight suspicion that it's not objectively bad, I can't evaluate the game accurately enough to review it. It's easier for me to analyze why someone would dislike a game that I enjoyed than to analyze why someone would like a game that I did not enjoy. Total Eclipse is different. In large part this is because I'm a huge Crystal Dynamics fan, so I was more driven to play the game inside out than I normally would be with a game that made me want to pull my hair out this much. Whatever the reason, after I finished the game (something I could only accomplish by using the level select cheat to emulate a password save) and started up a new game just to see if the early levels had become any easier with practice, something happened. The earlier levels had gotten easy enough that I reached the end of level 12 without using any continues, meaning the game isn't as unfair as I had first thought. 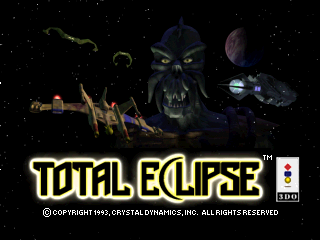 A calm came over me as I realized that Total Eclipse does have appeal beyond being a great tech demo for the 3DO, and that much of my frustration with the game comes from an obsession with completing games that most people do not share. Judged by my own feelings towards the game, it merits a 4 or 5 out of 10. 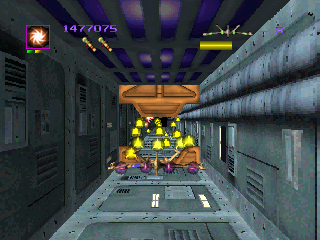 But while the game does have plenty of objective flaws, it is undeniably thrilling when you go barreling down a narrow tunnel, hitting speed boosters every step of the way to move so quickly that your mind can't process your surroundings, yet somehow avoiding the closing doors and enemy fire that try to bring you down. Or when you blast an enemy to smithereens just as the last of your shields are about to be depleted. If you want a game that's easygoing, a game which allows you the joy of unconstrained flight, a game which plays fair and doesn't make you feel like you're the pinball in a pinball machine - don't even consider getting Total Eclipse. But if you have no problem with never being able to beat a game, and you want to see just how tough a 3D space shooter can get - then Total Eclipse might be the game for you. Graphics 8/10 - The texture-mapped environments are stunning in both detail and atmosphere as you blitz through them, and the ship sprites are gratifyingly stylish. Sound 4/10 - The explosions and your ship's weapon fire sound great, but the enemies are oddly silent, even the bosses. The music sounds like it's coming from an obnoxious neighbor's stereo system instead of the game. Longevity 7/10 - 20 stages, and the sheer difficulty is enough to make the game last near forever. Multiple routes and power-ups provide decent replay. Controls 5/10 - Ahead of their time. 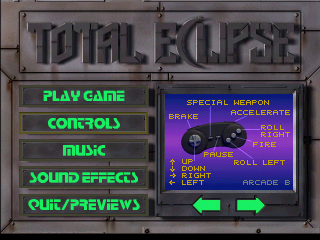 To be specific, if ever a game screamed for analog control, Total Eclipse is it. The amount of precision the game demands from you is virtually impossible to achieve with a D-pad. Overall 6/10 - Steep in difficulty and often unfair in design, Total Eclipse is not for the faint of heart but does have a well-realized roller-coaster-ish charm. Good review. I feel like this game would have been impressive when it was new, but personally I find the gameplay itself and the overall progression of the game to be overly tedious (said as someone who prefers action games over all others). There are some other technical issues as well that detracts from the experience, like your 2D ship slamming into objects when it clearly looks like you should have avoided them.